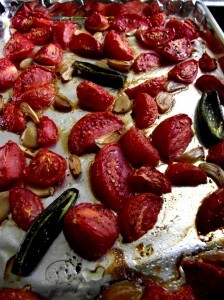 This isn’t a meal or even a side dish recipe- this is an easy roast tomato recipe that can be pureed or cut up and is the base for about a million different sauces. I use it for my Italian sausage lasagna, spaghetti or even as a base for tomato soup. Roasting the tomatoes brings out their natural sweetness and adds a little smoky/char flavour that will give depth to any sauce or soup. It’s also a great one for gardeners who get inundated with tomatoes as it freezes really well once pureed. The uses are endless so I always make giant batches and freeze it in 2 cup portions that I can pull out whenever I need them! If you have small (cherry/grape) tomatoes you can leave them whole or slice in half. For larger tomatoes, quarter or dice them. Toss the garlic cloves, quartered onions and tomatoes in olive oil and place on a foil covered baking sheet in a single layer. Sprinkle with salt & pepper and bake at 200 for 1-3 hours. The longer you cook them, the better your sauce base will be. If you’re freezing your tomatoes, puree them gently and then freeze.